I have heard and read a lot about the miracles of Argan Oil in the past few years, but I have never actually tried it before. I guess I was a little bit leery about putting oil ON my face. Seems backwards, right? However, when InstaNatural asked me if I was interested in trying a couple of their products, I jumped at the opportunity. The first product that I received was a hair mask. I don't dye my hair and I trim it pretty frequently, so I have been using this product as a conditioner once a week to reduce static and winter dryness. While I am fortunate enough to have fairly healthy hair, I can tell that using this product as a hair mask would do wonders to restore natural shine and health to color-treated or damaged hair (especially if you use a lot of heat to style your hair). The second product that I received was pure Argan Oil. I have been struggling horribly with dry skin this winter (especially on my forehead) so I was excited to see what all the fuss over Argan Oil was about. I'm not even exaggerating when I say that this product is life changing. Okay, okay. Maybe I am exaggerating a tiny bit, but haven't you ever felt this way about a product before? After using 2 drops of oil on my face daily for the past few weeks, I can honestly say that dry skin is not a problem for me anymore! I apply Argan Oil when I get out of the shower, then follow with my regular moisturizer (for SPF) and makeup routine. I have noticed a huge difference in the look and feel of my skin. My makeup even lasts longer throughout the day. I think when my skin naturally rebounds in the summer, I will apply Argan Oil at night and use it like a night mask rather than a day treatment. 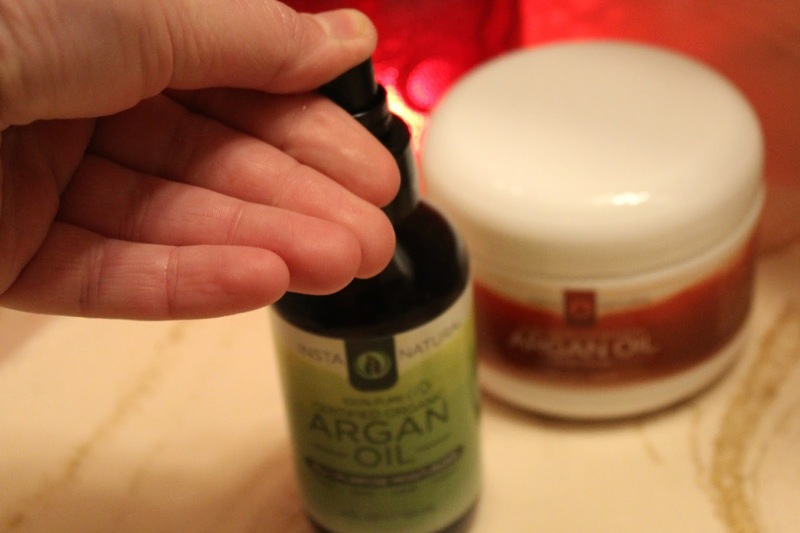 I also found that by applying a few drops of Argan Oil to my cuticles, I no longer have a problem with hangnails! The best part? You can get this 4 oz bottle of Argan Oil on Amazon for under $18. The Josie Maran 4 oz bottle is $96 at Sephora. Both products are 100% pure Argan Oil...this one just happens to be super affordable! Have you ever used Argan Oil before? This post is Powered by BrandBacker in partnership with InstaNatural Argan Oil. All opinions and photographs are my own. I really do love Argan Oil!